All times indicated are US Central Time. Welcome to the “Sixth Annual On-line International Live Video Graduate Student Workshop” taking place on 23-24 March 2018. 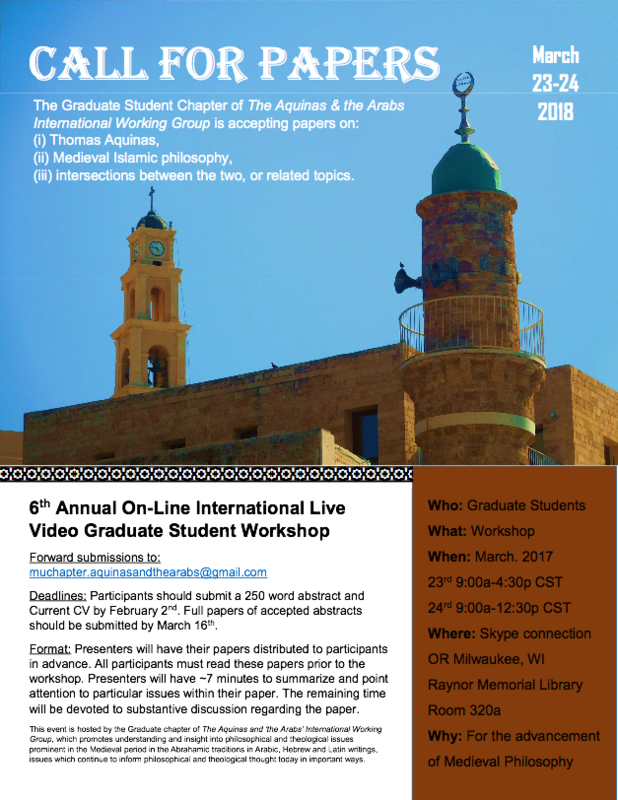 This workshop is designed to give graduate students working on Aquinas, Medieval Arabic philosophy, and the interaction between Aquinas and his predecessors in the Muslim world an opportunity to share their own research. For this reason the format is a bit unique. First, the workshop primarily takes place over Skype, to reduce cost and allow student colleagues from around the globe to participate. Second, rather than full live paper presentations, our presenters have submitted their papers for distribution to participants in March, to be read in advance of the workshop. The workshop presentations begin with a short introduction on key issues by the presenter with the rest of the time devoted to discussion and questions. Participants are encouraged to come with questions ready, and if possible, to have relevant texts on hand. Non-presenting attendees interested in receiving copies of any of our presenter’s papers (not for distribution or quotation), please email muchapter.aquinasandthearabs@gmail.com. We are pleased to have a wide variety of topics this year. We look forward this event. For further information, write to muchapter.aquinasandthearabs@gmail.com. Skype connection 10-15 min. before each session. 11:10-12:05 - Jonathan Culbreath (KUL, Belgium): Abstraction and Illumination in Thomas Aquinas: Agent Intellect as a Participation in Divine Light. meeting on Friday 10 February 2017. 10 February 2017. Deadlines: Participants should submit a 250 word abstract and Current CV by January 9. Full papers of accepted abstracts should be submitted by February 2. Presenters will have their papers distributed to participants in advance. All participants must read these papers prior to the workshop. Forward submissions to: muchapter.aquinasandthearabs@gmail.com. For more information, please see attached flyer." Welcome to the “Fifth Annual On-line International Live Video Graduate Student Workshop” taking place on 10 February, 2017. This workshop is designed to give graduate students working on Aquinas, Medieval Arabic philosophy, and the interaction between Aquinas and his predecessors in the Muslim world a space to delve deeply into students’ own research. For this reason the format is a bit unique. First, the workshop primarily takes place over Skype, to reduce cost and allow colleagues from around the globe to participate. Second, rather than full live paper presentations, our presenters will submit their papers for distribution to participants in February, to be read in advance of the workshop. The workshop itself will allow substantial discussion, with a short introduction by the presenter and the rest of the time devoted to questions. Participants are encouraged to come with questions ready, and if possible, to have relevant texts on hand. If you are interested in receiving copies of any of our presenter’s papers (not for distribution or quotation), please email muchapter.aquinasandthearabs@gmail.com. We are pleased to have a wide variety of topics this year, including: an exploration of Aquinas’ concept of Imago Dei, al-Ghazali’s innovative epistemology, Thomas’s conditions for science, and a comparison of Aquinas and Avicenna on Divine Will. We look forward to you joining us! Skype connection at 7:45. Please be prepared. Skype connection at 8:45. Please be prepared. Those interested in presenting must submit a 150 word abstract for a ca. 4000-5000 word essay, notes separate, by TBA. (DEADLINE). Papers may be on (i) Aquinas, (ii) Medieval Arabic philosophy, (iii) intersections between the two, or (iv) related topics. All submissions and comments must be in English. Students with accepted abstracts will be notified on TBA. Complete papers must be submitted no later than TBA. Please enter “Aquinas and the Arabs Graduate Conference Submission” in the subject-line of the e-mail. All applications must be accompanied by a CV. Papers will be distributed to participants on TBA. Presenters will have no more than 5-7 min. to present brief remarks indicating some of the key issues on which s/he would like discussion. The remaining time will be devoted to questions and comments by participants present online or in person. There will be a 5 min. break between presentations and a 90 min. break for lunch on Friday and Saturday. Full papers will not be read at the Workshop. Presenters will have 7 minutes to indicate parts or issues of the paper on which they would like to receive comments or discussion. Then the floor will be open for questions from any participants. We intend to use Skype with Google Hangouts as a backup in case of problems. All participants and attendees should have Google Chrome and gmail accounts in case we need to turn to Google Hangouts. Participants not physically present at Marquette University for this event should indicate the desire to ask a question by sending a text message to Marquette organizers from inside Skype. NOTE: ALL PARTICIPANTS MUST AGREE TO READ EACH OF THE CONFERENCE PAPERS. Again, note that papers will not be read at the conference since they are being distributed in advance to all participants. This will allow for more valuable discussion of the papers. All observers should register via email at www.aquinasandthearabs.org. Observers may request copies of the papers to prepare for the conference. Send your request to the email address mentioned immediately above. No papers will be distributed after TBA. Take Special Note: All presenters will need to set up a test connection with Marquette on DATE TBA. We will use Skype technology. Participants need only have a computer (Mac or PC) with camera and a fast internet connection (university campus ethernet preferred) as well as Skype installed. The Tech Test will take place at DATE TBA. Thanks to all participants for another fine meeting with excellent discussions. Special thanks to Nick Oschman who handled the technology for the event. Other help by Traci Phillipson, Tracy Wietecha and Evan Williams is also gratefully acknowledge. 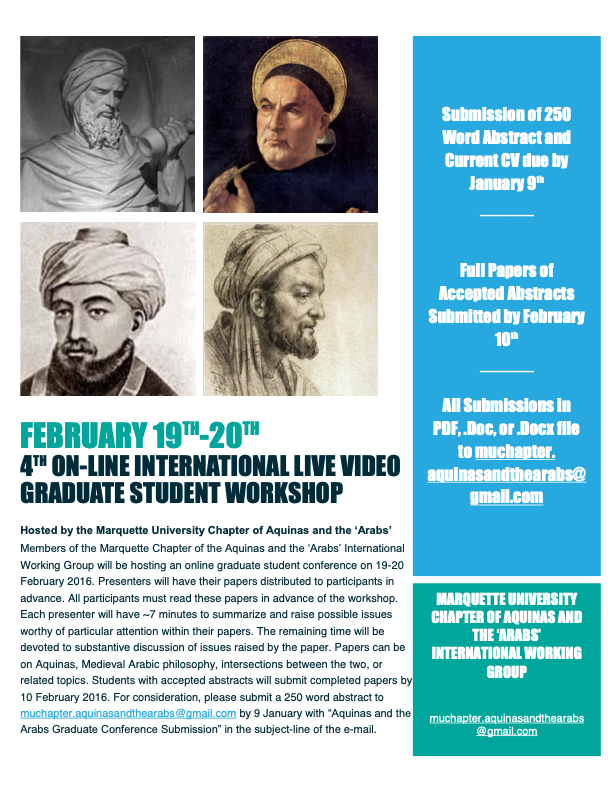 Members of the Marquette Chapter of the Aquinas and the ‘Arabs’ International Working Group will be hosting an online graduate student conference on 20-21 February 2015. Those interested in presenting must submit a 150 word abstract for a ca. 4000-5000 word essay, notes separate, by 22 January 2015. (DEADLINE). Papers may be on (i) Aquinas, (ii) Medieval Arabic philosophy, (iii) intersections between the two, or (iv) related topics. All submissions and comments must be in English. Students with accepted abstracts will be notified on 26 January 2015.  Complete papers must be submitted no later than 8 February 2015. Papers will be distributed to participants on 8 February 2015. Presenters will have no more than 5-7 min. to present brief remarks indicating some of the key issues on which s/he would like discussion. The remaining time will be devoted to questions and comments by participants present online or in person. There will be a 5 min. break between presentations and a 90 min. break for lunch on Friday and Saturday. Observers may request copies of the papers to prepare for the conference. Send your request to the email address mentioned immediately above. No papers will be distributed after 18 February 2015. 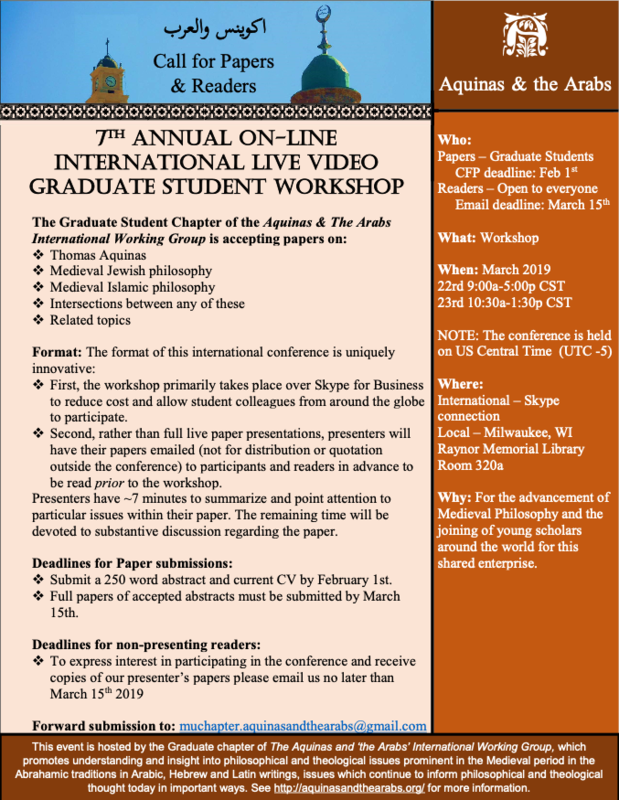 Members of the Graduate Student Group of the Aquinas and the ‘Arabs’ International Working Group will be hosting an online graduate student conference on 13-14 March 2014. Ten presenters will have ~7 minutes each to summarize their papers. Papers will be distributed to participants on 1 March 2014. Presenters will have no more than 5-7 min. to present brief remarks indicating some of the key issues on which s/he would like discussion. The remaining time will be devoted to questions and comments by participants present online or in person. There will be a 5 min. break between presentations and a two-hour break for lunch on Thursday and a one-hour break for lunch on Friday. Those interested in presenting must submit a 150 word abstract for a ca. 4000-5000 word essay, notes separate, by 7 February 2014. Papers may be on (i) Aquinas, (ii) Medieval Arabic philosophy, (iii) intersections between the two, or (iv) related topics. All submissions and comments must be in English. Students with accepted abstracts will be notified on 12 February 2014. Complete papers must be submitted no later than the deadline of 28 February 2014. Presenters will have 7 minutes to indicate parts or issues of the paper on which they would like to receive comments or discussion. Then the floor will be open for questions from any participants. We intend to use MSLync with Google Hangouts as a backup in case of problems. All participants and attendees should have Google Chrome and gmail accounts in case we need to turn to Google Hangouts. Participants not physically present at Marquette University for this event should indicate the desire to ask a question by sending a text message from inside MSLync or by sending an email to my email account: Richard.Taylor@hiw.kuleuven.be. NOTE: ALL PARTICIPANTS MUST READ EACH OF THE CONFERENCE PAPERS. Papers will not be read at the conference since they are being distributed in advance to all particpants. All observers should register with Daniel Adsett at www.aquinasandthearabs.org. Observers may request copies of the papers to prepare for the conference. Send your request to the email address in the previous sentence. No papers will be distributed after 11 March. Take Special Note: All presenters will need to set up a test connection with Marquette on 10 March 2014 at 10 am. We will use MSLync technology. Participants need only have a computer (Mac or PC) with camera and a fast internet connection (university campus ethernet preferred). The Tech Test will take place at 10 am Monday 10 March 2014. We will send the URL of the MSLync connection at 10:05 am Monday. Follow the directions to connect. Then be prepared to test the connection using Google Hangouts. Again, you must have a gmail account for Google Hangouts. NOTE: FOR EACH DAY THE INTERNET CONNECTION WILL BE MADE AT 8:30 AM. NO NEW CONNECTIONS WILL BE MADE AFTER 9 AM BECAUSE THE CONFERENCE WILL BE IN PROGRESS. DUE TO A PRESENTER DROPPING OUT, THE FRIDAY SCHEDULE HAS BEEN CHANGED. NOTE THAT ON FRIDAY THE WORKSHOP WILL BE 9 AM - 12:55 PM WITHOUT LUNCH BREAK. Between writing his Summa Theologiae and De Veritate, it seems as though Thomas Aquinas changed his mind as to whether prophecy is a habitus. In the former and later work, Aquinas seems to categorically deny the possibility of prophecy being a habitus while in the latter and earlier work, his opinion is much more ambivalent. This essays asks (1) whether Aquinas did in fact change his mind and (2) if so, why. Ultimately, it is argued that Aquinas does reconsider whether prophecy is a habitus. It is suggested that, over the course of his career, he wanted to distance himself from Avicenna’s naturalized theory of prophecy. Hence, if Aquinas wanted to distinguish himself from the Islamic philosopher earlier in his career, as Dag Nikolaus Hasse suggests, he separated himself even more so later on. In Aquinas’s Summa Theologiae, he argues that the human intellect can only know singulars by returning to the phantasms, something the separated soul after death but before the resurrection cannot have because it lacks a body. Yet Aquinas needs to make room for the separated soul’s knowledge of singulars and not leave it in a completely confused state in order to account for the agony of sinners in hell, the intercession of the saints on behalf of souls on earth, and overall the soul’s knowledge of itself. Aquinas therefore makes room for singulars in four ways: “to which they are determined by former knowledge in this life, or by some affection, or by natural aptitude, or by the disposition of the Divine Order” (ST I, Q89 A4 Body). I explore what these ways imply and how they all rely on God’s universal application of grace. Arabic philosophers knew several versions of the conflict between determinism and free will coming from the Greek tradition, from deterministic positions such as that of the Stoics, to compatibilist positions such as that of the Peripatetics. Al-Fārābī’s approach to this difficulty introduces relevant nuances. The aim of this paper is precisely to reconstruct and analyze Al-Fārābī’s compatibilist argument as is presented in the second section of his Long Commentary on Peri Hermeneias. There, Al-Fārābī argues for the compatibility between the epistemic access of the First Cause to future events and the contingent nature of sublunary events. The argument can be presented as a dilemma: the first horn sustains that the actions of sublunar substances cannot be determined because of a “principle of contingency” that characterizes their nature; the second horn defends the epistemic privilege of a God whose omnipotence let him know everything that exists in reality without any deficiency or indeterminacy. Essay aims to (re) determine the metaphysical status of the soul in Aquinas’ Summa Contra Gentiles and Quaestiones Disputatate De Anima. It uses the method which could be called “fight Aquinas with Aquinas” as it highlights the passages in which Aquinas, as his own opponent, gives alternative views to his well established doctrine of the substantial unity of the body and soul and shows how can they provide the foundation for its reconstruction. The axis of this essay is Summa Contra Gentiles (2.80-81.12) which indicates there are two types of understanding that correlate to the composite and separate substance, implying that the body and soul, when separated, indeed have a separate being. Although the soul as a separate substance has an operation which is entirely separated from the body, this is not the operation to which Aquinas gives his full attention and from which he draws his final conclusion. This passage, however, gives enough evidence that the metaphysics of the composite substances cannot at all times and in all circumstances be applied to the human (rational) soul, which, taken separately from the body, must be given its right to be a hoc aliquid. Within the Farabian corpus, al-Farabi takes two seemingly distinct stances on the determinacy of future particulars. He explicitly affirms that the prophets can know future particulars, thus affirming the determinacy of future particulars in general, in Mabādi’ ārā’ ahl al-madīnat al-fādilah. Elsewhere, when he deals with the issue directly in Sharh al-Fārābī li-kitāb Aristūtālīs Fī al-’Ibārah, addressing the Principle of Bivalence, he denies the determinacy of future particulars (at least in regard to propositions which involve human action). I argue that given his cosmology, al-Farabi is able to both deny the metaphysical determinacy of future particulars which relate to human action, and accommodate the determinacy of nature beyond human influence. While generally future particulars are indeterminate, for al-Farabi there are some future matters which the prophets can know, namely those matters which will exist without fail and contingent matters which are beyond human influence and necessarily follow from already determined particulars. In this paper I argue that Aquinas’s doctrine of prophecy develops from the early period (De uer. q. 12, a. 1, prophecy is a habit) to his more mature articulation (ST IIa‐IIae q. 171, a. 2, prophecy is not a habit) as a result of his complex handling of the metaphysical thought of Avicenna. Aquinas subtly distances himself from the implication of Avicenna’s emanationist framework for prophecy, namely that prophetic knowledge is acquired through perfected intellectual habit. Yet at the same time he accommodates this aspect insofar as it aligns with Augustine’s biblical neo‐Platonism. He does so, as I shall demonstrate, with Augustine’s notion of prayer (orandi) as a kind of inquiry (disputatio) that disposes the soul to aptly receive the prophetic light by the extension of grace. In this, Aquinas incorporates Avicenna’s notion of prophetic habit without committing to the emanationist model from which it arises. I explicate a subtlety operative in Averroes’ Distinction of Discourse: “unbelief” is differentiated correlative to the degree of one’s philosophical aptitude. The “unbelief” in those who are inept at philosophical discourse takes the form of a confusion regarding the legitimacy of the apparent sense of scripture and doctrine. Such confusion impedes their assent to God, confusion being a corruption of the means for non-philosophical assent. The “unbelief” of those who are adept at the practice of philosophy, however, is the activity of causing this confusion in others. Through corrupting the potential of non-philosophers for assent to God, the philosopher is also culpable of “unbelief,” albeit of a different kind. What is most striking is that this corruption is the very activity of indiscriminately disseminating philosophy! In this paper I utilize the recognition of the heterogeneity of “unbelief” in order to better explicate the sociological concerns and metaphysical problems considered in Averroes’ Distinction of Discourse. In this paper I explore methodological approaches to Aquinas’ argument for a real distinction between essence and existence in creatures in De Ente et Essentia. Joseph Owens and John Wippel examine the text through three stages which, they conclude, result in a demonstration for the real distinction. I contrast this approach with R.E. Houser, who argues that Aquinas’ text, which proceeds dialectically, must be understood within the context of its sources, namely Avicenna’s Metaphysics of the Healing and The Intentions of the Philosophers by al-Ghazali. I will come to two adjudications: first I will offer an evaluative judgment on Owen’s and Wippel’s disagreement on which stage Aquinas demonstrates a real distinction; second I will offer an evaluative judgment on the nature of the treatise as a whole, ultimately arguing for the methodology of source based contextualism which studies a text within the context of the sources used to produce the text. Thursday 21 March 2013 (Marquette Location: Coughlin 238): Avicenna & Aquinas. 10 - 10:55 am Milwaukee: Katja Krause, King’s College London, “Enhanced for Ultimate Knowledge: Aquinas’ Latin and Arabic Sources for Explaining the Light of Glory”. 11 - 11:55 am Milwaukee: Traci Phillipson, Marquette University & Katholieke Universiteit Leuven, “The Will in Averroes and Aquinas”.